While we participate in this event a lot, it is still very special to us! The Crown Point “Pinnacle Peeps” presented the I.W.I.N. Foundation with a check for $500. 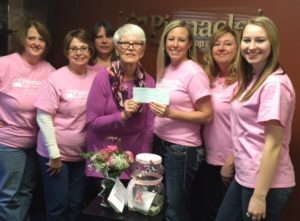 The money that was raised from their annual “Casual for the Cause” campaign (see October) will help ladies in Northwest Indiana that have Breast Cancer. Please check out the I.W.I.N. Foundation page for more information.